When I read magazines I cut or rip out pictures, words or headlines that trigger something in me – even if I don’t know what it is. I then stick them in the blank pages of my journal. Later, when I turn the pages to write, I come across an image that sparks my imagination and sets off a train of thought. Does that make sense? Anyway, this image has been a particularly powerful one for me in recent weeks. At the time of seeing it (in Elle Decoration, I think … possibly advertising rugs) it just struck a chord so I cut it out and stuck it in. Now it’s become a metaphor for my life! I see myself sitting on a packing crate in an empty room. (Not being as attractive as that woman, obviously. Or female. It’s a metaphor, remember.) I feel like I have just moved in and it’s that lull before the removal people arrive with all my worldy belongings. I have the opportunity to start again and ‘furbish’ my life as I please. But I have to think about that, because it’s so easy to simply arrange things as they were before. It’s time to think what I want to have in this room now; what do I need for this phase of my life. When Jo stayed with me the other week, we re-arranged my room. We moved everything around – many times – before we got a new layout that felt right and met the criteria I had in mind, as well as opening up some new possibilities. We’d talked about it before, but I couldn’t bring myself to do it. But this time I bit the bullet and it worked. It feels OK too. I’d even go so far as to say I like it. (That may sound a little underwhelming but it’s quite something for me to admit to being OK about anything!). As in the external, so in the internal. I’m thinking carefully about what I want in my life and everyday experience – I’m not in a rush to fill my life up with ‘the same old same old’. I’ve learned to do without a lot of things and, you know, I really don’t miss them. I feel I should, but I really don’t. For some time, many of us have been talking about de-cluttering, down-sizing and adopting a life of greater simplicity. For me, sitting on a packing crate in an empty room seems to be the outcome. The overall theme I work to in my art is "Images of Earth and Spirit". Within that, though, I like to develop different themes and to produce a series of work depicting each theme. Such as "Walking on Water", which I've got running currently. Years and years ago I heard about planes landing at Heathrow - which they do. What I read was, that at any time, the flight controller would be managing 3 planes - one which was touching down imminently; one which was lining up on the runway; and one which was still some way in the distance but was getting into alignment. And that has often served me as an analogy in the way I manage things. One thing I'm playing close attention to; one thing I'm trying to get in place for a landing; and one thing at a bit of a distance but that I'm aware needs some attention. I have 3 things currently in development. a series of studies called "Stripped". These are photos of places I've been, that have had some significance for me, that I tear apart and try to depict what is going on behind the scenes. I've just started going back into Mid Wales do some sketches and photos on the theme of "Contour". This is just beginning to line up in my thinking. (I've just got back from there so I'm writing all this down while it's fresh in my mind. I have the memory of a goldfish). Bearing in mind that I'm good at starting things but not good at seeing them through to completion, I'll blog about these as I go to try to record the development. This is not only for my own purposes, but also because I'm hoping for some connections and conversations about them as I go along. That way I may be able to figure out what on earth I'm thinking and doing. Naked Wales is an Art and Design Website based in Wales. It includes news, articles, jobs, events and a gallery. They have just produced the second issue of their magazine, which is available on-line at www.nakedwales.com/mag/ISSUE2_WEB.pdf . Inside you will find a book review by moi. I try to get out for a walk each day. I take a small sketch book and pencil. Being a person of routine, I take the same route each day (though if I’m feeling very daring, I may do it in reverse!) (obviously I don’t mean I walk backwards) (clear?). I go to Bute Park and as I enter I feel myself relax. I’m a bit of a regular now and most of the trees recognise me so we have a little chat as I walk. (Stop me when this gets too weird for you). There are open spaces, patches of grass and wildflowers, wooded areas and a river. It’s all rather lovely. I try to do a sketch each day. Actually, I try not to try because that makes it an effort – an attempt to be productive so I can justify my time. I don’t often get asked, but in my head I hear it all the time: “What did you do today?” Saying I went out sketching sounds so much better than saying I went out for a walk. But I often do anyway. A sketch, that is. (Try to keep up). And I’ve noticed that my drawing ‘style’ has changed. I don’t know what it used to be like – a bit heavy-handed I think. But now it’s a lot gentler. The lines are lighter on the page, the forms a lot more … well, feminine actually. And, in fact, some of the tree trunks I sketch begin to look like the female form. (Don’t get all Freudian on me … I know how it sounds). I’m enjoying watching my style develop and change. It pleases me. It doesn’t come naturally yet – I still often find myself adding too many lines, too many marks, too much shading. But if I don’t try too hard, it sometimes happens. 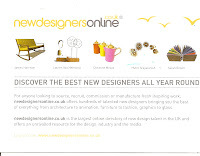 On Friday, Jo took me to the New Designers exhibition at The Business Design Centre in London. New Designers takes place in two parts from 3-6 July and 10-13 July 2008, presenting the next generation of designers to the industry. Thousands of designers, graduating from the UK's design courses, display exciting and truly original work to industry, the public and the media. We went to the first week, which was showing the work of textile designers and ceramicists. It was an inspirational day. The first thing that caught my eye was the work of a textile artist called Amy Carlisle. Amy used an abstract expressionist style (which obviously resonated with me in terms of my own approach) to produce large pieces of colourful and energetic fabric. But what fascinated me most was the way she demonstrated her research and development. 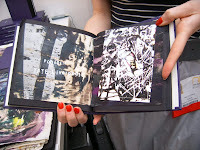 Rather than simply displaying her sketch books, she had sewn the images and references onto paper and then had them bound up into hard- back books. The books themselves were pieces of art and I so much wanted to buy one! Documenting the process is an important part of textile design because of the need to be able to reproduce the material at a later date if required. This is something you don’t see so much in fine art where the finished piece stands alone. But I am fascinated by processes and it made some of the work much more interesting and engaging. It seems to generate more conversation around the work, and I think that’s important. Later in the day I came across Alison Reynolds and Julie Price from West Wales School of the Arts. I had met Alison and Julie a few times before at Craft Markets in the Rhondda. Now, though, I was able to see their full-scale work and contrasting styles… and brilliant it was too. Overall, the thing that struck me most about New Designers, was the vast potential it represented. It’s not just a design exhibition; it’s a trade show and a commercial opportunity. The graduate designers showing there are looking for sales, commissions, work opportunities. They have been trained over a number of years and are now hungry to make their mark. They need to be put to work in relevant and productive ways to bring their education, vision and skills into the world. Sadly, as we all know, many of them (like those of us who’ve gone before!) won’t achieve that. But I’ve always had a passion for young people with their energy and potential, so I’m going to find ways to play a part in facilitating that.